Defendant, a resident of Carmel, Indiana, is accused of selling counterfeit golf clubs and golf accessories. In addition to trademark claims, the Complaint includes a wide range of Indiana code violations. Acushnet Company et al. v. Nunns et al. Here’s an interesting case involving the trade dress of two Indianapolis neopolitan pizzerias (i.e. “fancy pizza”). Broad Ripple-based Napolese, owned by the same restauranteur as popular local brunch spot Patachou, has complained that the new Crust Pizzeria Napoletana has copied the look and feel of Napolese. Crust is owned by another local restauranteur, Mohey Osman, of The Egyptian Cafe fame. In case you haven’t read it in awhile, here’s the preeminent decision in this area, the Supreme Court ruling in Two Pesos v. Taco Cabana. 1. Taco Cabana was a chain with 6 locations open for 7 years by the time of the lawsuit. Napolese has had one location in Broad Ripple for four years. Is the Napolese trade dress well known, much less famous (to support the dilution claim), outside of mid-Marion County suburbanites? a. Napolese doesn’t consider their trade dress to be very strong beyond the local level. The Complaint relies heavily on the fame of the Patachou brand but is light on discussion of the strength of the Napolese trade dress specifically, although the Napolese trade is what is actually at issue). b. Napolese doesn’t want the formalities and high legal costs associated with federal court. c. Napolese may not intend to follow through with the lawsuit. It’s possible the Complaint may just be a cost-effective method (cheaper than advertising) to alert the public that Crust is not associated with Napolese and also expose the many similarities, making Crust look tacky in the process. Napolese may be gambling that media pressure on Crust will force some modifications and they can drop the lawsuit before they get too deep. The reality is that defending a lawsuit (particularly with a prestigious firm like Woodard Emhardt as counsel) is much more expensive than changing your logo and menu colors. The trade dress of Napolese and Crust is probably similar enough to defeat any counterclaim that this is a “frivolous” complaint, which could entitle Crust to attorney fees, so Napolese has the upper hand to drive this litigation as far as they want it to go. 3. One more thing to consider is the similarity of the trade dress of other neapolitan pizzerias across the state/country. 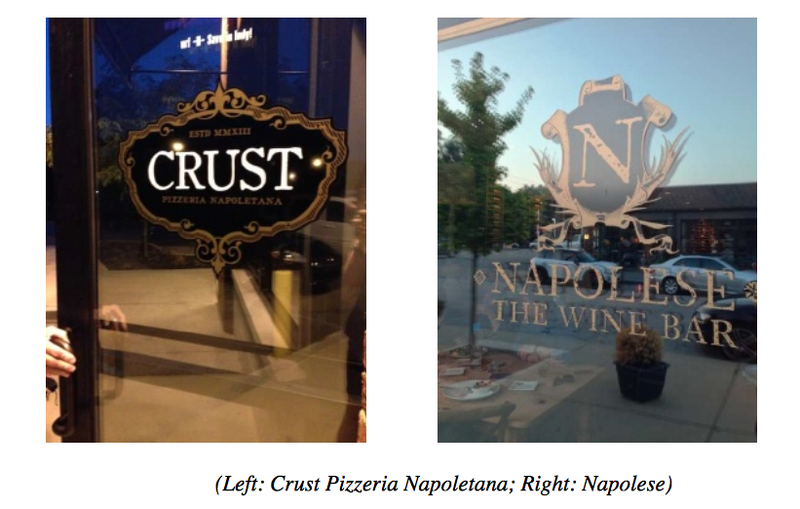 If neopolitan pizzerias frequently utilize the stone oven/shield logo/bar stool/whatever, that info could affect both the “distinctiveness” analysis for the Napolese trade dress and the “likelihood of confusion” analysis in comparing Crust trade dress. I don’t usually eat fancy pizza so I can’t comment here. What are your thoughts on the Complaint? More info about the lawsuit is available in the Indianapolis Star. Stay tuned to this blog for updates.